A seal in Winthrop causes a stir. Today we responded to a seal in Winthrop...twice! Kerry and Ulrika were in Winthrop responding to a dead porpoise when we received a report of a live seal not far away. They took a drive over to check out the seal and found a plump little harp seal resting on the beach. The animal did not have any obvious life threatening injuries so they took took some photos, reviewed the case with the Winthrop Animal Control Officer, who was on site with them, and headed to the next call. Below are two photos Kerry and Ulrika took of the seal in the late morning. As you can see in the photo on the left the animal is resting on it's back with not a care in the world. In the photo on the right the animal shows his alertness after responding to a noise off shore. Unfortunately, some well meaning citizens panicked that the seal was out of the water. One citizen even went so far as to take a bucket he found on the beach and pour water on the seal. For those of you who follow this blog, you know that seals are a Federally protected species and that even approaching a seal is illegal. (Read about the Marine Mammal Protection Act in previous blog entries here and here.) In addition to the citizen who poured water on it, other citizens went to the fish market and purchased a bag of fish, which they planned to feed to the seal. Luckily for both the citizens and the seal, the Harbor Master and the Animal Control Officer were back on scene and put a stop to the illegal feeding session that was about to ensue. After a number of people harassed this animal despite our best efforts to educate them over the phone, we went back out to check the animal. In the photo below, Kerry and I do a close approach to examine this seal. We are able to do a close approach on this animal because the Aquarium Rescue Department holds a Federal permit for marine mammal stranding response and rehabilitation. People reported seeing blood on this animal, however all we found was a few minor scratches associated with the nail beds on the front flipper and a scratch on the back of the neck. Neither were of any medical concern. As you can see the seal is alert and agitated by our approach, one of the reasons why a permit is necessary. Because seals are wild animals, they are unpredictable and will bite if threatened, hence the protective herding board we have with us. The number of people harassing this animal concerned us. For the safety of the animal we decided to kennel it and move it to a quiet beach were it could get the rest it needed. Seals are semi aquatic and need to spend a certain amount of time resting on shore or rocky ledges. We tend to see prolonged resting periods by the youngsters especially after a storm like the Nor'easter we had recently. In the photos we herded the seal using protective boards into the kennel. We cover the kennels for the trip up to the truck to minimize stress for the animal. The photo below shows the fish that were purchased by a citizen in hopes of feeding the seal. Seals won't eat dead fish, they eat prey items that are live and swimming. These fish would have rotted on the beach or someone would have received a serious and painful bite. The photo below shows the bucket that was used by a man on the beach to pour water on the seal. 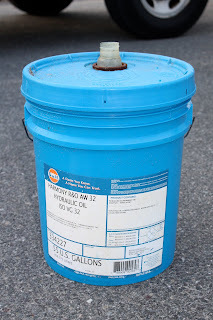 If you click on the photo below to enlarge it, you will see that this bucket was used to store hydraulic oil. I examined the bucket and found a thick coat of sludge-like material in the bottom of the bucket. Not only was the act of pouring water on the animal illegal, it could have seriously harmed the animal as well. Before we released the animal I checked its eyes and examined it's mucus membranes for signs of irritation from the material in the bucket. The photos below show us at the final release beach, as you can see it was dark by the time we got there. You will notice a large orange dot on the back of the seal. I put that marking on the seal with a cattle marking stick so we will know if this animal comes back up on the beach. We released the animal on the beach and then quietly backed off and departed. I did not want to put the seal in the water since it came up to rest but didn't get any with all the activity and harassment. We left the seal resting comfortably on the release beach. I'll go back at first light to check to see if it is still there and do another visual assessment of it's activity level, alertness and body condition. Harp seals typically rest on the beach for 3-4 days before heading back into the water. They do not need food or water during that time and do just fine out of water. We did collect the bucket and will turn that over to federal law enforcement officials. The Aquarium's role is limited to rescue and rehabilitation and associated activities. We are not involved in law enforcement activities, however we are obligated through our permit to collect evidence in law enforcement cases and turn it over to NOAA law enforcement agents. PARTING THOUGHTS: This is important please read. It is never a good idea to try to approach, feed, or touch any wild animal. Wild animals, including seals, carry diseases that can be transmitted from them to humans. If you find a wild animal and are unsure what to do, the best thing to do is contact the appropriate authorities for information. I recommend starting with your local Animal Control Officers. These are trained experts with knowledge of local species and connections to other wildlife experts for unusual cases. Here are some more tips on what to do if you encounter a stranded marine animal. Special thanks to the Winthrop Animal Control Officer and Harbor Master and the MA Environmental Police for their help with this case. The harp seal made news, read a brief summary of events on WBZtv.com. Check out our video of a successful seal rescue earlier this winter! You'll notice the herding boards and kennel. Beautiful map of dolphins' movements!